Santa Anita Park's empty grandstand in Arcadia, Calif. 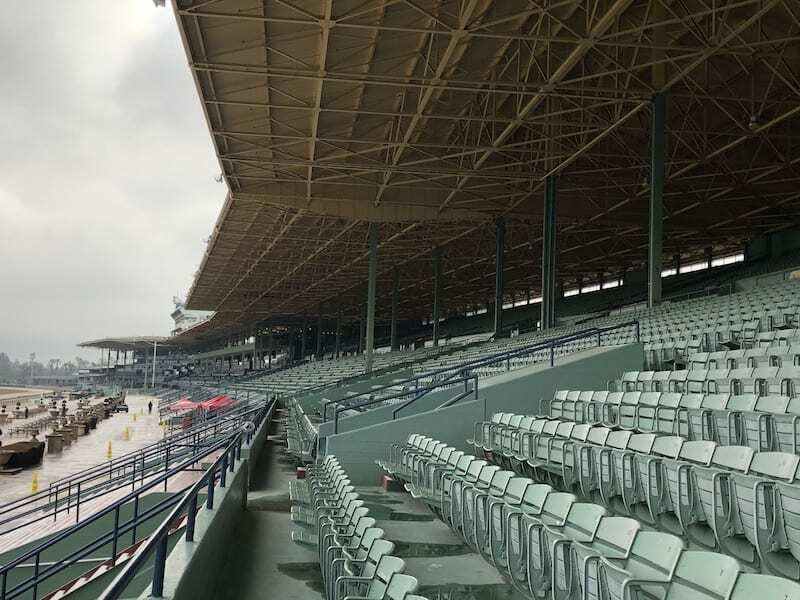 Racing at Santa Anita will not resume on March 22 as previously announced after officials with The Stronach Group – owners of the Arcadia, Calif., track – were unable to reach an agreement on a ban of the anti-bleeding medication Lasix with the Thoroughbred Owners of California. A ban on race-day Lasix, or furosemide, was one of several medication and welfare reforms put forth as “house rules” by Belinda Stronach, chairman of The Stronach Group, in response to the unusually high number of fatal injuries – 22 since the Dec. 26, 2018, opening day – sustained by horses racing or training at Santa Anita. Alan Balch, executive director of California Thoroughbred Trainers, broke the news to his membership in a Friday night email, saying that he had received a call from Stronach Group Racing and Gaming division chief operating officer Tim Ritvo telling him entries would not be taken for the March 22 program. Ritvo confirmed the impasse with TOC will prevent racing from resuming March 22. The track has not conducted live racing since March 3. A training fatality on March 5 prompted officials to close the track for racing indefinitely. Training over the main dirt course was also halted so consultants could investigate whether the racing surface may be causing the spike injuries. A series of meetings on the reforms had been conducted this week involving the Stronach Group, TOC and the CTT, along with officials from the Del Mar Thoroughbred Club in Del Mar, Calif., which begins its summer meet in mid-July. When the reforms, including a ban on Lasix, were announced on Thursday, however, there was no agreement between Stronach Group officials and the TOC, which has statutory rights as the recognized horsemen's organization in California. The announcement by Belinda Stronach in an open letter to the industry came hours after a filly severely injured while training became the track's 22nd fatality. The fatal injuries have attracted both local and national media attention in recent weeks. Greg Avioli, president and CEO of TOC, could not be reached for comment. According to Balch, Del Mar and Los Alamitos in Cypress, Calif. (the latter hosts both Thoroughbred and Quarter Horse racing), will allow race-day Lasix during their meetings. A similar effort by Ed Allred, owner of Los Alamitos, to impose house rules at his track – hair testing of horses that led to a drug disqualification – was shot down in Los Angeles County Superior Court in 2016. A judge said the rules were not in accordance with California Horse Racing Board regulations in place at the time. This entry was posted in NL Article, The Biz and tagged alan balch, belinda stronach, california thoroughbred trainers, furosemide, lasix ban, santa anita shutdown, The Stronach Group, thoroughbred owners of california, Tim Ritvo by Ray Paulick. Bookmark the permalink.